Oregon's Rogue River is world-renowned for its legendary salmon runs. Visitors from all corners of the country and the world come to raft, fish, hike and explore this natural treasure. We applaud members of Oregon's congressional delegation for taking steps to safeguard it. In June, Rep. Peter DeFazio and Sen. Ron Wyden introduced legislation to secure wild and scenic protections for 143 miles of cold water fish-bearing tributary streams of the Rogue. We hope that committee hearings will be scheduled soon so that this bill can move quickly through Congress. The Rogue is a river that inspired author Zane Grey to write novels, including "Riders of the Purple Sage" and "Rogue River Feud," that evoked the history and wildness of the West. After floating the Rogue and witnessing its steelhead and salmon runs, Grey bought a cabin along the river, which is now held in public trust for future generations. Grey's love for the Rogue was a testament to the grandeur and unique character of this river, its fish and its wildlands. 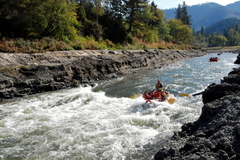 We too have experienced the "wild" Rogue -- the exhilarating rapids, abundant wildlife and, of course, the salmon. The river is a cornerstone for Pacific salmon in the lower 48, and the lifeblood of the salmon and steelhead that annually fight their way upstream to spawn. These salmon, however, face an increasingly challenging task to reproduce and remain healthy and viable in the reality of a warming climate, changing ocean conditions and impaired water quality resulting from logging, mining and off-road vehicle use in surrounding forests. Emergency closures for fishing of wild spring chinook in the Rogue have become the norm for the past three years due to depressed numbers, and coho are listed on the Endangered Species Act. The current situation and dire projected forecasts dictate quick action on behalf of salmon, which are a valued and historic symbol of the Pacific Northwest. The need to protect this wild river and its valuable fish runs is clear. The increasingly obvious link between attractive, healthy public lands and the well-being of surrounding communities makes such protections even more compelling. These "gateway communities" provide food, lodging and other services for visitors, but also offer an enhanced quality of life to residents due to their location near natural resource areas. The well-being of these communities is at risk if the natural resources they depend on are threatened. As stewards of the environment and creators of history, we must take swift action to safeguard one of the West's most iconic rivers and its salmon. We encourage the Oregon delegation to make the Lower Rogue legislation a priority and pass it during this Congress. The Rogue is a testament to America's rich natural history, and it is up to us to secure this wealth for future generations. John Kitzhaber is a former Oregon governor. Bill Bradbury is a former Oregon secretary of state. Both are running for the Democratic nomination for governor in 2010.